On the cover... Bob Bruso, PGA, hits a tee shot during the 2018 New England PGA Section Championship, where he qualified for the upcoming PGA Professional Championship. Dear Fellow NEPGA Golf Professionals and Associates, I would like to take this opportunity to usher in the 2019 golf season in New England with my best wishes. I hope many of you had the opportunity to enjoy some rest and relaxation during the off-season and had a chance to recharge for the upcoming season. GOOD LUCK IN 2019!! MAKE IT THE BEST YEAR EVER!! Our Spring Meeting was held on Tuesday, March 26th at Andover Country Club and I am always excited for the start of our meeting season. It is so great to see my fellow golf professionals and inform President you on what is happening with your organization. The addition of the New England PGA vendor showcase was a hit when it originated a few years ago and it still is a big part of our relationships with our partners. It goes to show how much work Mike and the staff put in to create partnerships. The dedicated partners that we have in our section were excited to attend as you all could see by the number of participants that walked up in front of the audience to start the meeting. The NEPGA is very fortunate to have such wonderful supporters of our PGA Professionals. BOB BRUSO, PGA BLACKSTONE NATIONAL GOLF CLUB Bob Bruso, PGA, First Assistant Professional at Blackstone National Golf Club (Sutton, Mass.) will make his third appearance in the PGA Professional National Championship in Bluffton, S.C., at the end of the month. He finished tied for ninth at the 2018 NEPGA Section Championship to advance to the PNC with the help of an improbable birdie late in the Section Championship. NEPGA: How has the Professional National Championship move to April affected your preparation? Bob Bruso: I’ve been down to Florida 3 or 4 times to play in winter series events. I’ve also been hitting balls indoors at Blackstone. NEPGA: Describe your most memorable shot from the Section Championship that helped you advance. BB: I holed out on 18 for birdie after a penalty drop at Warwick. If it wasn’t for that shot there’s no way I would of made it. 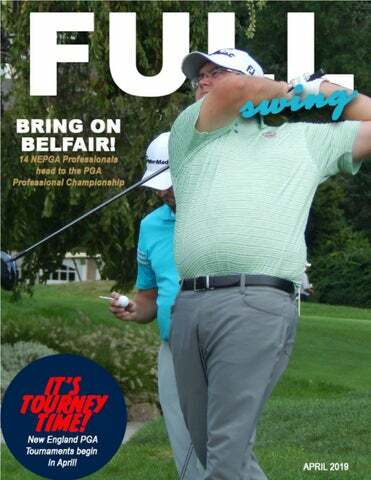 NEPGA: What do you know about Belfair and how it will suit your game? BB: I’ve never played it. I’ve heard it’s not a long course. I can take advantage of my length and steady driving. KIRK HANEFELD, PGA SALEM COUNTRY CLUB Kirk Hanefeld, PGA, is no stranger to high-level golf. He has played in two PGA Championships (1990, 2013), one U.S. Open (1990), 71 Champions Tour events – making 65 cuts – and has won three New England Section Championships. He’s won two Senior PGA Professional Championships and lost count of how many times he’s played in the PGA Professional Championship. Later this month, Hanefeld will be up against a younger field full of long hitters at the PGA Professional Championship, but oddly enough, he’ll rely on his driver to give him advantage. NEPGA: What can you take from previous PNC experience to use to your advantage? Kirk Hanefeld: I’m so old now, and played so many events, that experience, I’m not sure how much it’s worth now. Anytime you play in a decent-sized tournament, it’s good. Unfortunately, because of the time of year, I don’t know how ready I’m going to be. Distance, for me, has really become an issue with the length of the golf courses we’re playing. My experience will help, as it does in any event, but I’m not sure how measurable that is. NEPGA: What are your goals at the Professional Championship? Liam Friedman: I’d love to win the thing. Definitely being in the top 20 is a huge goal of mine with the PGA Championship being at Bethpage this year. Bethpage is probably my favorite course. I’m from Buffalo, so I used to play the State Open at Bethpage every year, so I just really love it there. I’d love to finish top 20 and go to the PGA there. NEPGA: What are your favorite memories from Bethpage? LF: I only played Bethpage in the State Open. I had a round at Bethpage where it was the final round of the last State Open I played. I made the cut but was in the middle of the pack. It was the worst ball-striking round I have ever had as a professional. I hit three greens in regulation, made two birdies, and I had one blow-up hole with a triple, and I think I shot two-over on the day and moved up like 20 spots on the leaderboard. I got up and down, I don’t know, 13 of 15 times, or something like that. It was crazy. Bethpage is such an awesome place. The front nine you get out and ease into the golf course and you’re like ‘I can make birdies out here’ and then you get to number 10 and you’re like ‘uh oh.’ The back nine is just relentless. DAVID BENNETT, PGA COUNTRY CLUB OF VERMONT David Bennett, PGA, was in the middle of the pack after an opening round 75 at the 2018 NEPGA Section Championship. But some solid golf over the final 36 holes propelled him into the top-10 and earned him a spot in his third PGA Professional Championship. Bennett fell short of making the cut in his two previous appearances, but his experience has taught him that simply playing some solid golf could be the ticket to his first PGA Championship start. NEPGA: How has your preparation for the championship been? DB: My preparation has pretty much consisted of skiing this winter. It’s going to be interesting and challenging. I did get down to a member’s trip in March to play some golf for four days, other than that I haven’t touched a club since October. Hopefully I get some practice in over the next few weeks and then be able to get down on the 22nd, so about a week beforehand to get some practice in. I’m going to be significantly underprepared compared to years past. But that’s just the nature of being a full-time New England person, especially in Vermont. There’s just not an opportunity to play a lot of golf, and my job is year-round. NEPGA: After being there twice before, what advice would you give yourself going into this year’s championship? DB: In years past you have this expectation that you have to play amazing golf to get through to the PGA Championship. If you look at scores in the past, somewhere around even-par over four days is good enough to get in most of the time. It’s coming in with the expectation that you have to play solid, consistent golf, but you don’t have to play incredible golf. Obviously, you have to play well. I think I put too much pressure on myself the last couple times. This time I’m going to go in with a care-free, fun attitude and just enjoy the experience. I’ll have my family with me once again and if I play consistently over four days and don’t do anything outrageously great or outrageously poor, I think you have a chance to get through to the next level. to about six feet, and that calmed me down a little bit. I called it a Jon Rahm moment, but I could have had a Jordan Spieth moment up around the water hazard there. Especially when your brain is cooking and you’re just trying to get done. So I assume you made the six-footer? I did not (laughs)! There’s not a happy ending, no. I did not make it, but I wound up right on the number. I thought for sure that I had butchered that last hole. Final thoughts as the PGA Professional Championship Approaches? It’s been a couple of years since I qualified for the regular Professional Championship. I have nothing to lose. I’ll just go down there and hopefully catch a little fire with my game. I’m looking forward to it. As far as pressure, I don’t really feel any. Jeff Martin, PGA disadvantage, they don’t get a chance to spend their winters in Florida. I think it’s my responsibility to ramp myself up and get ready for this tournament because I have the opportunity. I need to take it upon myself to work hard to play as well as I can. TROY PARE, PGA LEDGEMONT COUNTRY CLUB A three-putt on the 53rd hole of the 2018 NEPGA Section Championship nearly cost Troy Pare, PGA (Ledgemont CC) a spot in the upcoming PGA Professional Championship. But in the end, Pare qualified on the number and will attempt to reach the PGA Championship for the second time later this month. Pare played in the 2010 PGA Championship at Whistling Straights where he finished +3, missing the cut by just two strokes. No stranger to the PGA Professional Championship, Pare is approaching his 10th trip to the national tournament. NEPGA: Describe your most memorable shot/moment that helped get you into the Professional Championship field. TP: Honestly I thought I shot myself in the foot on the 53rd hole of the tournament. I played very conservatively and hit the green in two and had 25 feet for birdie, and I ended up three-putting. I thought I tossed my chances out the window. I made a par on the last hole and I thought I missed (qualifying for the PNC). When it was all said and done, I ended up making it on the number. All you can try to do is turn those lousy rounds into something that’s halfway decent. The first day at Warwick was incredibly hard. It was breezy, the greens were firm, fast, and the place was tough. The biggest thing for me was just getting through Round 1 on the most difficult golf course. TP: I’ve only made it through (to the PGA Championship) once, that was in 2010. I finished fifth in the tournament and made it to the PGA Championship at Whistling Straights. Being there at least once, at the Major and knowing that I can compete with those guys – I finished +3 for the tournament at the PGA and missed the cut by two – but just knowing that I can compete out there, I want to get back again. I want to at least make the cut and see where it goes. JEFF MARTIN, PGA WOLLASTON GOLF CLUB Like many of us, Jeff Martin, PGA, spent the winter sitting on his couch watching Netflix. But unlike most of us, Martin is just a few weeks away from attempting to qualify for the PGA Championship for the fourth time. Martin finished -6, one stroke behind champion Rich Berberian, in the 2018 NEPGA Section Championship to secure a spot in the PGA Professional Championship for the 15th consecutive year. The Head Professional at Wollaston Golf Club (Norton, Mass. ), Martin qualified for the PGA Championship in 2005, ‘08, and ’13. NEPGA: How has your preparation been affected by the long winter? Jeff Martin: My preparation has been non-existent. If you call sitting on your couch watching Netfix preparing for our biggest tournament of the year, then yes, I’ve been preparing! When the PGA of America moved the Professional Championship to the end of April, they put almost everyone in the Northern states at a disadvantage. Needless to say, it’s going to be a challenge! So, for me its going to be like cramming for a test. I will practice as much as I can in the next three weeks to try and get my game to where it needs to be and try to figure the rest out when I get to South Carolina. NEPGA: What are your goals at the Championship? JM: Winning is always the ultimate goal but there are other things to be thinking about as well. A top-20 finish will get you a spot in the 2019 PGA Championship at Bethpage Black and a top-5 finish will secure a spot on the 2019 PGA Cup Team. These will definitely be on my mind as I head to the Professional Championship in a few weeks. FOUNDATION CORNER NEPGA FOUNDATION TO RAFFLE OMEGA SEAMASTER WATCH The New England PGA Foundation is raffling off an OMEGA Seamaster Diver 300m Gents’ Collection Watch. The watch is to be featured in the upcoming James Bond movie starring Daniel Craig! Tickets cost $50 for 1 ticket, and $100 for 3 tickets. All proceeds will go to the New England PGA Foundation to help fund our Military PGA HOPE Clinics, Boston Children’s Hospital Clinics, PGA Professional Grants, the NEPGA Junior Tour, as well as academic scholarships. Do not miss out on this great opportunity to support the New England PGA Foundation! The retail value of this watch is $4,850. If you would like to purchase tickets, or if you have any questions about the New England PGA Foundation please email our Foundation Coordinator Christian Comeau, PGA at ccomeau@ pgahq.com or call the NEPGA office at (508) 869-0000. Special thank you to Barmakian Jewelers forsupplying the NEPGA with this luxury watch. other words, there are no consequences for bad behavior under the Rules, unless the player’s conduct is so egregious that the Committee has no choice but to disqualify them. If this sounds familiar, that’s because it was true under the old Rules, as well as the new. So why, you may ask yourself, am I talking about a Rule that hasn’t changed for this year? That’s because the Rules of player conduct can change in 2019, but those changes are up to you! For the first time, the Committee now has the right to institute a Code of Conduct as a Local Rule, meaning that disqualification isn’t necessarily the only option for a player who is not behaving in appropriate ways. You, the PGA Professional who is likely the Committee for competitions and general play at your club, now have the right to apply a one-stroke penalty or the general penalty for misconduct on the golf course. However, if you wish to assign penalties for certain behaviors at your course, you do have some responsibilities, and homework to do before changing the penalty structure regarding player conduct. Before writing your Code of Conduct, here are some of the things you’ll need to consider (and once these decisions are made, be sure to put them in writing as part of the Code! ): •	Who will have the authority to decide penalties and sanctions? Is it only certain Committee members, or is there a minimum number of Committee members who need to be involved in the decision? Does any member of the Committee have the authority to decide unilaterally? •	Will there be an appeals process? •	What behaviors will be prohibited? Some examples of conduct that may be included: o	Players entering specified no-play zones o	Failure to rake bunkers, fill divots, fix ball marks o	Unacceptable language o	Abuse of clubs or the course o	Being disrespectful to other players or officials/staff o	Failure to meet the dress code •	Does the Code apply to caddies (can the player be penalized under the Code of Conduct for the actions of his or her caddie during the round)? WE ARE GOLF is a coalition to tell the true story of golf. Not just the game, but the stories of the hardworking men and women who make it the greatest sport in the world and whose livelihoods depend on it. This newfound ability to institute a Code of Conduct as a Local Rule is another great example of the USGA and R&A’s efforts to afford the Committee more flexibility in how we run our golf tournaments, or even everyday play at our clubs. I just wanted to make you all aware of one of the new tools you have at your disposal, that you can use to motivate your golfers to take better care of the course, preserve the image of the club that they represent, and ensure that all of their fellow golfers are being treated with respect. Please refer to Section 5H in the Official Guide to the Rules of Golf for more info, or as always, reach out to me at any time for help. April marks the opening of the New England PGA Tournament season, and the section has three exciting tournaments on the schedule this month. The competitive season kicks off with the NEPGA Pro-Am at Marshfield CC (Marshfield, Mass.) on April 16. The section is excited for its inaugural Blind Draw Scramble at CC of Halifax on April 18. The event aims to foster friendship, new relationships, networking opportunities and competition as a Blind Draw Scramble kick-off event. The season-long NEPGA Stoke Play Series also begins in April, with the first of five regular-season 18-hole individual stroke play tournaments being contested at beautiful Newport National on April 22. BLIND DRAW SCRAMBLE PROMISES EXCITING, UNIQUE DAY OF GOLF If you’ve seen the New England PGA tournament schedule for 2019, you’ve probably noticed a new event on the slate as the season kicks off. The inaugural NEPGA Pro-Pro Blind Draw Scramble, to be played April 18 at the Country Club of Halifax (Halifax, Mass. ), promises to provide an exciting and unique day of golf as NEPGA Professionals find their form for the 2019 season. The blind-draw format adds a twist, and a bit of suspense. Players register for the tournament individually and the four-person teams will be drawn at random during lunch, then head straight to the course for the shotgun start. Those 65 and over will play from “Senior” tees. Given the nature of the event, it couldn’t come at a better time in the busy NEPGA Tournament schedule. Those who have been hitting into a simulator all winter and those who haven’t swung a club in months will get a chance to tune up their game with a fun 18 holes while connecting with section Professionals they wouldn’t ordinarily play with. The $100 entry fee includes lunch, carts, and golf on one of the best championship layouts in the Bay State. Senior tees for players 65 and older! Updating Employment, Classification, and Section Affiliation is an important step for all members and associates at this time of year as it relates to the annual dues invoices that will be created for fiscal year 2019/2020. Please take the time to review your information not only including employment, classification, and section affiliation but also your preferred address, mobile and home phone, and your email address on your personal dashboard on www.pga.org. Please be sure to submit any changes by April 15, 2019. If you have any questions, please call the office 508.869.0000 or email jstuart@pgahq.com. Annual dues are invoiced as of May 1, 2019 and are payable by June 30, 2019 to avoid suspension and assessment of the Late Fee. STILL LOOKING FOR AN ASSISTANT? All NEPGA Professionals who would like to list an Assistant Professional or Teaching Professional opening for 2019 on www.nepga.com can email the information on those openings to Joan Stuart at jstuart@pgahq.com and it will posted under our websiteâ&#x20AC;&#x2122;s Employment Tab until that position is filled. Please include a brief description of the position, the deadline for resumes, the dates of employment and contact information. It is always recommended that these positions are also posted on www.pga.org. Also, if you need help for outside operations or are looking for a position for yourself, we can also list those for you. If you are interested or have any questions, please call the NEPGA office at 508.869.0000. If you are interested in obtaining a position or a new position, we do also offer this service on our website. Please email Joan Stuart at jstuart@pgahq.com if you would like to use this service. Please be sure to contact Joan Stuart at jstuart@pgahq.com or by phone 508.869.0000 if the position that has been posted on the website has been filled. Visit the NEPGA Junior Tour online and be sure to promote NEPGA Junior programs to the juniors at your facility! PGA JR. LEAGUE NEW RULES: KEY CHANGES The 2019 PGA Jr. League Conditions of Play has been updated and posted on PGAJRLEAGUE.com. There will be no limitations to the amount and form of advice a Captain or Coach gives to their players so long as they do not delay play. Throughout local league play, Section qualifiers and Championships, all players designated to hit from the back tees will play first on every hole to ensure maximum safety. Teams will no longer be penalized at Section qualifiers and Section Championships if they do not have all 10 players present. Permanent roster replacements will be allowed for any reason with proper documentation. Players are now allowed to place and replace their ball as many times as they choose and by any means they choose (use of a club, dropping instead of placing). Players are unable to receive free relief from an object that does not cause interference at the original spot of the ball. PGA Jr. League is introducing a pace of play policy that will be enforced throughout the postseason. Click HERE to view the pace of play policy. The Olde Barnstable Fairgrounds GC team of Dave Sheret, John Fowler, Ryan Mulligan & Dave Hasseltine won the 2018-19 CAPE COD PGA WINTER BOWLING LEAGUE after 12 weeks of ‘intense and fun’ competiDave Sheret, John Fowler, Ryan tion featuring 10 club Mulligan & Dave Hasseltine teams from across the chapter. All but Hasseltine work in some capacity at OBF. In all, over 20 Chapter PGA members participated including such ballers like Jeff Halunen – PGA Head Professional (Pocasset GC) and Mike Vidal PGA Head Professional (Willowbend) who both have averaged nearly 200 for the past several seasons! The league has been warmly received by longtime Chapter Sponsor Jeff Moore, proprietor of THE LANES BOWL & BISTRO (Mashpee Commons) and his three fabulous BOBBY BYRNES PUBS across the Cape. 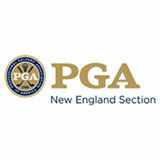 CONGRATULATIONS to a pair of new PGA Members – Robert McCarthy (TGC at Sacconnesset) and Andrew Morris (Kittansett), and to Nick Wiseman who is representing the Jane Frost Performance Golf Center at Sandwich Hollows GC and recently earned his TEACHING & COACHING certification from the PGA of America. Cape Cod Chapter tournament season kicks off in late April with many outstanding venues, formats and camaraderie. The Chapter is pleased to invite non-chapter members to register in most of their offerings, and want to remind those who are still working toward their Class A status that they are invited to play in all events – including their respective CHAPTER CHAMPIONSHIPS. The Cape visits Wianno Club for their 2-day championship Sept. 15-16. Chapter President Eric Steindel will host the Cape’s big event! of most of the respondents. To this end, our schedule has returned to Pro-Ams on Mondays (as much as possible), different venues, non-competing dates and the return of the “Dugas Cup” event at Cape Arundel GC in October. Also, Pro-Ams have been set up to allow PGA Professionals or Assistants to bring more than one team of amateurs. The complete schedule is available on our website. Education: Along with Maine State Golf Association, the Chapter co-hosted a Rules of Golf seminar on Thursday, March 28th at The Purpoodock Club. It was a great success with a total of 85 attendees, making it the largest seminar we’ve had that anyone can remember. Website: A new Maine Chapter website launched on March 1st. Please take a minute to check it out at https://mechapter.com and please support our listed partners. Once the season gets underway, look there for tournament results and news. Drive, Chip and Putt: Val Halla Golf Course will again host this year’s local DC&P qualifier. Slated for June 1st, the event attracts juniors from all over New England and beyond. Volunteers are always needed, so come help and earn some MSR credits. Junior Golf: This will be our second year administering the Maine Junior Tour which we took over from the MSGA. There are 13 events scheduled, which is one more than last year. Membership registration opened March 1st and event registration went live on March 15th. Wendy’s is our main partner again. The Junior Tour also has a new website: https:// mechapter.com/junior. Last season we gave out nearly $4,000 in retail value of prizes such as golf balls, clubs, bags, shoes etc., that were donated to the program from various sales reps. We’re on track for about the same this year. Annual Spring Meeting: Maine’s spring meeting is slated for Tuesday, April 16th at The Woodlands Club in Falmouth. Registration starts at 8:00am and the meeting will begin at 9:00am. A continental breakfast will be available. Some of our sponsors will be in attendance, displaying their latest products, so come early. The meeting should end by noon and an optional educational seminar is scheduled for the afternoon. The cost for those who opt to stay for the seminar will be $20 and will include lunch. Attendees will earn (2) PGA Required Education MSR Hours. Registration is available here. The topic for the seminar will be “Enhancing your Tournament and Events Program” Presented by Dan Venezio, PGA, Portland Country Club & Don Doyon, Maine Operations Manager. Participants will gain hands-on experience with the premium version of the USGA Tournament Management Program (Golf Genius). Director of Golf at Nashua CC who was received the Horton Smith Award. Representing over 100 PGA Members within their chapter – the Rhode Island Board of Directors has been meeting all winter to organize and coordinate issues at hand. Rhode Island Chapter Tournament season kicks off in late April with many outstanding venues, formats and camaraderie. The chapter is pleased to invite non-chapter members to register in most of their offerings, and want to remind those who are still working toward their Class A status that they are invited to play in all events – including the CHAPTER CHAMPIONSHIPS. Rhode Island’s CHAPTER CHAMPIONSHIP will be hosted by Troy Pare, PGA HP at Ledgemont GC (Oct. 1st). es with the flexibility of the competitors schedules. We hope to see everyone May 2nd for a day filled with golf, camaraderie and friendship. The 2019 NEAA Schedule is close to being finalized. Please see below for the most up to date schedule: Season Long – Individual Match Play Championship – limited to the first 32 players to enter May 2nd– NEAA Annual Spring Meeting & Golf Event (Marshfield CC – 8:30 am; Shotgun) May 16th – Hudson Cup (Duxbury Yacht Club – 7:30 am; Tee Times) May 23rd – Spring Championship (Valley CC – 7:30 am; Tee Times) September 16th – 17th – NEPGA Assistant’s Championship (Pocasset CC – 7:30 am; Tee Times) October 4th – NEAA Fall Event (@ – TBA (TBD) October 10th – NEAA Annual Fall Meeting & Golf Event (Blue Hill – 8:30 am; Shotgun) We look forward to seeing everyone this spring and wish all a successful and productive 2019 season. Save the Date! Friday, April 26th the Senior Association will kick-off the 2019 Tournament Season with their Spring Meeting at Cyprian Keyes Golf Club in Boylston, Mass., at 9:00 am followed by a blind draw Pro-Pro. Come join the Association, reconnect with your peers and catch up with them on how they spent this past winter. 2019 Senior Association Tournament Schedule Apr 26	Cyprian Keyes GC	Spring Meeting 9:00 am with Pro/Pro after May 23	Gannon GC	Pro/3 Am June 18	George Wright GC	Pro/3 Am July 11	Louisquisset GC	Pro/3 Am – 9:30 shotgun July 25	Mt. Pleasant GC	Pro/Pro Aug.	Tatnuck CC Pro/3 Am (date TBA) Aug. 20-21 Woodstock CC NEPGA Sr Champ Sept. 19	Bass Rocks GC Pro/3 Am Sept.	Needham GC Pro/3 Am (date TBA) Oct.	Kirkbrae CC (date TBA) Senior Fall Meeting and Senior Assoc. Championship Membership Dues are $25 and the Senior Association is open to any PGA Professional in good standing who will turn 50 years of age in 2019. For more information, please contact Joe Carr, PGA 508.873.7768 or Dennis Selvitella, PGA 508.410.4984. To pay your 2019 Senior Membership Dues, please click here. The NEPGA Avidia Bank MasterCard As a Member of the NEPGA, you are entitled to the following Member Benefits offered through Avidia Bank “The Official Bank of the NEPGA” and Proud Supporter of the NEPGA Foundation! Corporate cardholders enjoy NO interest and NO payments for 90 days during the 2nd quarter of every year! Visit nepga.avidiabank.com for complete details! Merchant Benefits • Reduced Processing Fees • No Monthly Maintenance Fees • 50,000 rewards points added to your PGA MasterCard. A percentage of EVERY purchase will be donated to the NEPGA Foundation. Card holders generated more than $20,000 for the Foundation in 2018! • No-Cost EMV-compliant terminal Want to learn about how Avidia Bank can save you money on your credit card processing costs? Email us at: merchantNEPGA@avidiabank.com. Take advantage of our referral program to earn even more! Credit Card Referrals = 4,000 Reward Points Credit Card Processing Referrals = 8,000 Reward Points Visit nepga.avidiabank.com for complete details! *Transactions excluded from point calculation include cash advances, ATM withdrawals, convenience checks, and balance transfers, any fees and card-related charges posted to a Card account, tax payments or any unauthorized charges or transactions. Avidia Bank is not affiliated with any retailer participating in the bonus point program. Avidia Bank reserves the right to change the program at any time. ATTEND PGA, USGA, PGA TOUR, WORLD GOLF AND LPGA EVENTS FOR FREE Because everyone loves free tickets... Do you love attending golf events as much as you lov eteaching the game and bringing golfers to your facility? If so, be sure to take advantage of the complimentary tickets offered by our industry partners. NOTE: Complimentary access to the Masters, the Open Championship, USGA, PGA Tour, and LPGA tournaments is determined by their respective organizations on an annual basis. Click here to take advantage!